Businesses have security policies, but nobody cares. What good are best security practices and policies if your employees aren’t sticking to them? New research among UK workers are doing just that – not adhering to their own companies’ cybersecurity policies. The report was released by ESET and Kingston Digital, and is based on a poll of 500 British business leaders. It says that almost 70 per cent of companies do have best practice guidelines, but most people aren’t paying attention to them. Almost half (44 per cent), for example, don’t secure removable devices such as USB sticks with anti-virus software. Not only does that leave a business vulnerable, but also opens the doors for a potential GDPR fine, and we know how hefty those can be. ESET’s cybersecurity specialist Jake Moore says businesses are moving in the right direction with guidelines, but that’s obviously not enough. “IT teams must work closely with other departments to ensure that employees are following the guidelines on a day to day basis and they have the right tools to protect their work and the entire organisation,” he says. 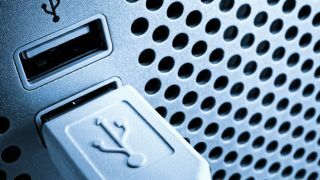 Thumb drives are a huge security risks for companies for many reasons, including the possibility of losing them (together with sensitive data), or using them elsewhere and transferring malware onto the corporate network. It has come to a point where IBM, for example, has completely banned the use of thumb drives.